View Poll Results: How would you rate 'Batman Begins'? I really like episides like this where they do things a little differently. I thought the news report idea was very good and it really did feel like you were watching the news - to my knowledge this had not been done before (but I'm sure it has been done since). 2nd- You feel like you are an earth viewer, since it is a "documentary" episode. 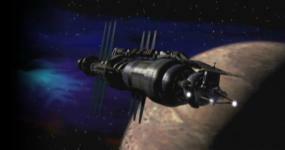 3rd- It is well seen the behavior of most important races, namely: Narn, Centauri, Minbari, Vorlon and Human. 4th- It is well shown the "dynamics" of B5 environment. I recommend for those who has no patience to start from the very begginning. This episode lets you catch the saga to keep going. I liked this episode; I think it would be a good introduction for newcomers, though it offers little by way of information for those who are keeping up with the details of the story arc. I like the way it's presented, as if we're watching the programme directly. Considering the way B5 is presented in the news later on, it is shown quite positively here. Did anyone else think of Galaxy Quest's "Never give up, never surrender" when G'Kar said the Narn motto is "Never surrender"?! Precisely - Galaxy Quest could have referenced B5. That's a really good episode for sure. It has action, intrigue, drama, tragedy, it's loaded with negative elements and yet manages to finish on a positive note. It has several instances of subtle irony for those who already know the story. And because it is, or seems to be intended as an introductory episode, it could have been made as a straightforward, dumbed-down piece. But it wasn't, it was intelligent and thoughtful, with great dialogue about human attitudes toward the Minbari War and other alien threats. I remember seeing it when it aired, thinking this is weird, this is just a silly way to do an episode. But by the time it was over I thought it was one of the more satisfying ones they did up to that point. Maybe overall. And they tell us in the beginning that it ends with the deaths of hundreds of people, and yet don't really give anything away! Very engaging. "Well, well. Looks like the pain's real for both of us." Some subtle hints of jingoistic bias in the news, like the editorializing in their mention of the Mars rebellions, Clark's popularity "soaring to new heights" (I think that was the line) due to his "focus on Earth" (more a slogan than a meaningful statement of fact apropos to journalism), and of course her treatment of Delenn--interjecting an accusation while Delenn was trying to answer her question (how she thought humans would feel about her metamorphosis) and basically backing her into a corner--that was painful to see. And of course, "but we didn't lose the Minbari War--they surrendered." I love Sheridan's response to that, "of course"--you could see him saying "I see" in his head and getting a clear idea of what he was dealing with from that exchange. And you know what? We see little things like this in the news today, increasingly so with the 24-hour-opinionverse of cable TV. But it was downright objective compared to what came a couple years later. Kosh blowing her off was classic too. I thought the Psi Corps PSA was a bit cheesy--kind of like a PSA you might have seen in the 1950s (then again, they were probably in a very 50s-ish time on Earth, a period of conformity and paranoia). Might have been interesting to see a commercial for a product as well (like normal TV commercials) for some period color. WOW!!!!! I can't believe anyone has anything negative to say about this episode. AND NOW FOR A WORD is A+++++. That's right, five plus signs is my highest rating . . . for now. I would definitely say this is one of my Top Ten favorite episodes if only for the fact that I was so blown away when it originally aired. It seemed so innovative and out of left field. I NEVER expected to see an episode like this. I think it is fantastic and it came a a perfect time in the series. If anyone had been paying close attention this should have been an award winning episode for ingenuity in the mist of an overall arc. Yeah I can see where people find faults with certain little things here and there, but I love it. Okay I had to come back and revise my assessment because I remembered the one thing I don't like about this episode. I don't like that Cynthia Torqueman is able to 'turn the screws' on Delenn. But seriously it has never felt right that Delenn gets rattled by Torqueman's questions. I completely recognize that it is a bit of brilliance on JMS' part, but I just wish Delenn was not seen in that light. We know the Minbari don't have "The Press", so it makes sense that Delenn would not know how to or be prepared for this situation, but Delenn is all powerful and should be prepared for every situation. Anyway, that is one thing I don't like, but I would not change because it actually makes complete and total sense. It is just a sign of where Delenn will grow in the future. Torqueman is raising a totally natural objection to Delenn's transformation. (She's doing it in an incredibly passive-aggressive, brutal, and un-journalistic way, of course, but her point still stands.) And Delenn realizes Torqueman has a point, an angle she never even considered -- an angle which could ruin her entire mission in going through the chrysalis. And I just now realized this: when Sebastian asks Delenn if she's ever considered that she might be wrong, and she says yes -- this scene is one of those times.